PLEASE NOTE: We no longer post Bike Spotting on this page! The temperature is dropping faster than the leaves, and the U of T campus is filled with throngs of students and their bikes. The earth has come full circle around the sun, and we’re back to the start of the school season. 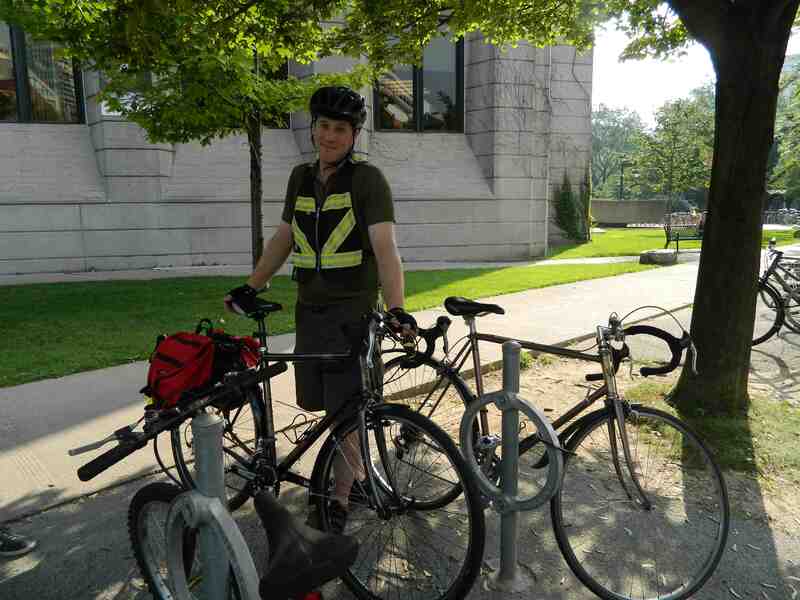 The dandy team went to Robarts Library at the corner of Harbord and St. George streets to give student cyclists a pop quiz about passing etiquette. We asked: What are proper techniques for passing cars and other cyclists? 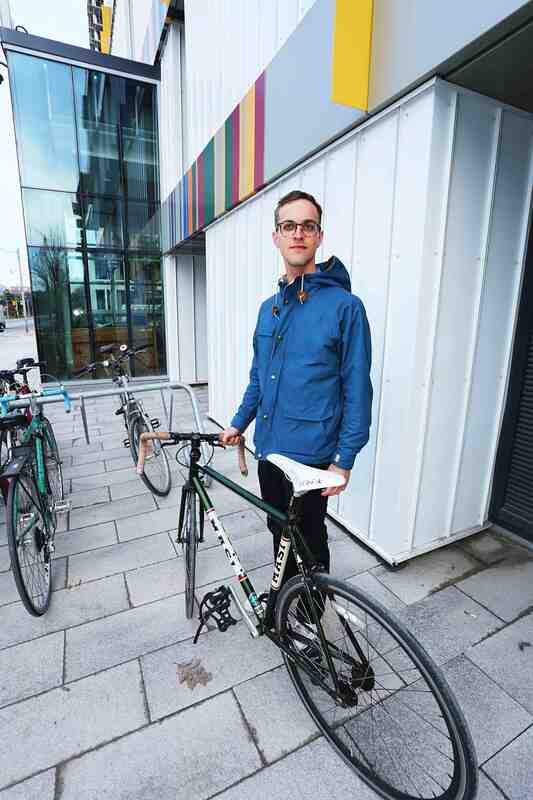 And What advice would you give to students who are just starting to commute by bike? I just got back from China where cycling is a lot different. I would regularly wear a face mask to filter out the pollution which at times can be very bad in Beijing. 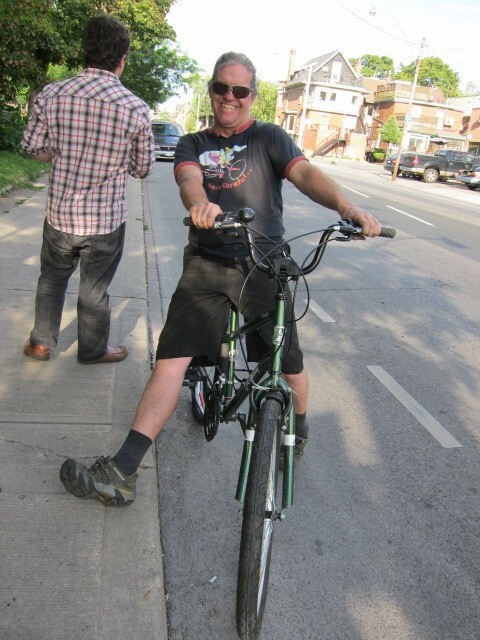 Here in Toronto, I’m surprised about how vocal people are in terms of making sure cyclists strictly follow the rules. The city trains new cyclists. As for safe passing, I am always extremely aware about the possibility of car doors opening. When passing, I always make sure to pass on the left. 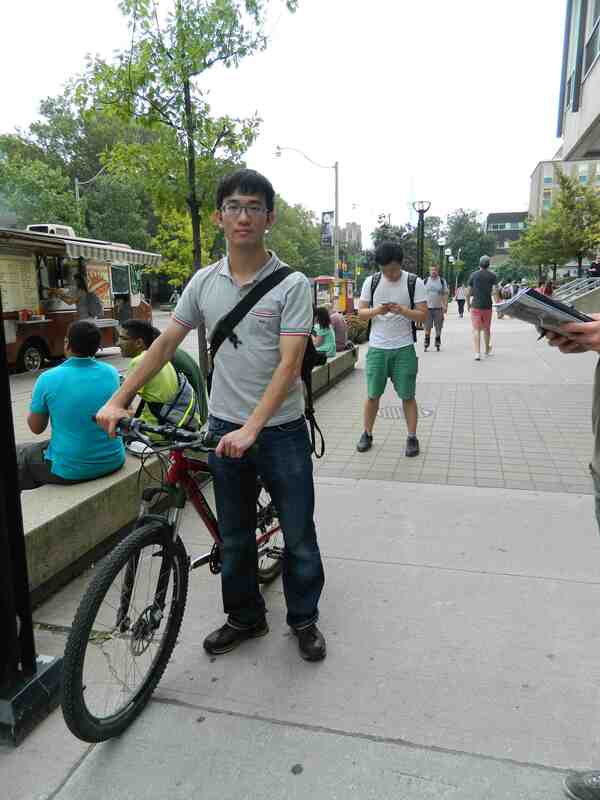 I’ve been back for three months and I am taking Chinese lessons at U of T to keep my language skills sharp. It’s awesome to be back in Toronto! I am a research analyst at Rotman School of Business. When biking on St. George behind a slow cyclist, sometimes the car traffic doesn’t allow enough room to pass and so you just need to be patient. You need to shoulder check first to ensure there is enough room to pass slower cyclists on the left, and then you can overtake them. What bothers me about cyclists passing is, when many cyclists are lined up at a red light, and a cyclist from the back will overtake the line without really announcing themselves. They sort of creep up on you, which can be dangerous. I Have been cycling here for three years. When passing I always pass on the left. I have never really experienced problems with cyclists overtaking on the right. My main advice to new cyclists would be to be very careful about bike theft. 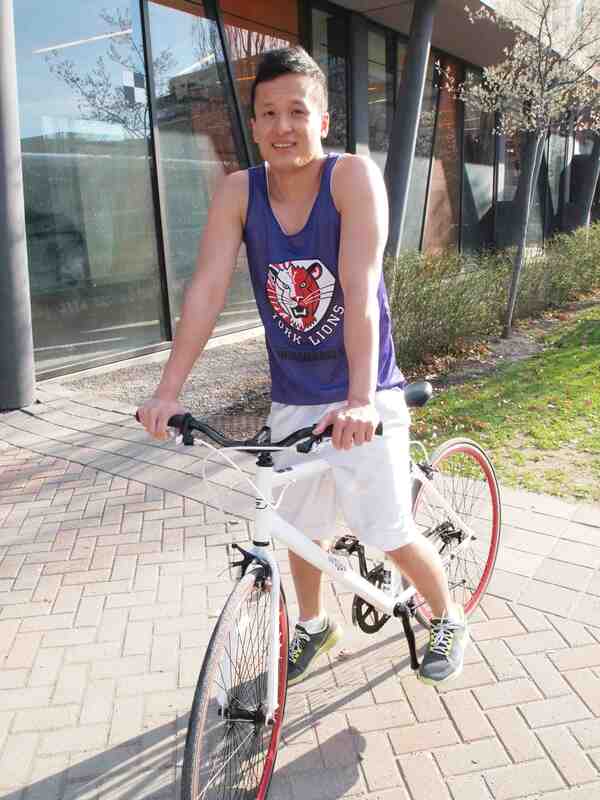 Always lock up securely, and be careful about leaving your bike out overnight. My wheels are secured well, but once someone stole my handlebar, brake levers and all! 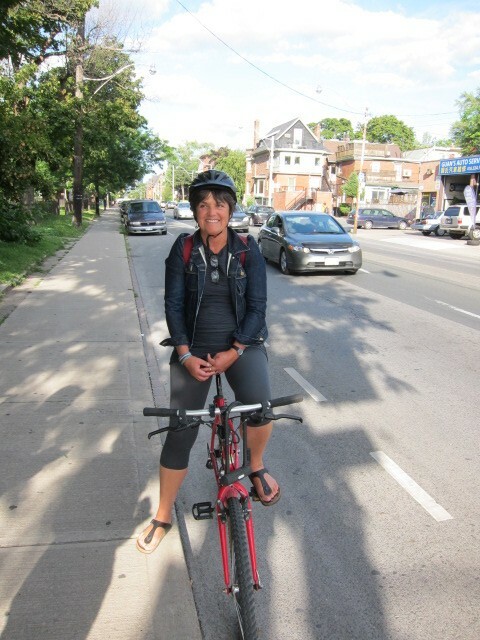 Anne Harris: Studying the Effects of Bike Infrastructure on Safety in Toronto and Vancouver. 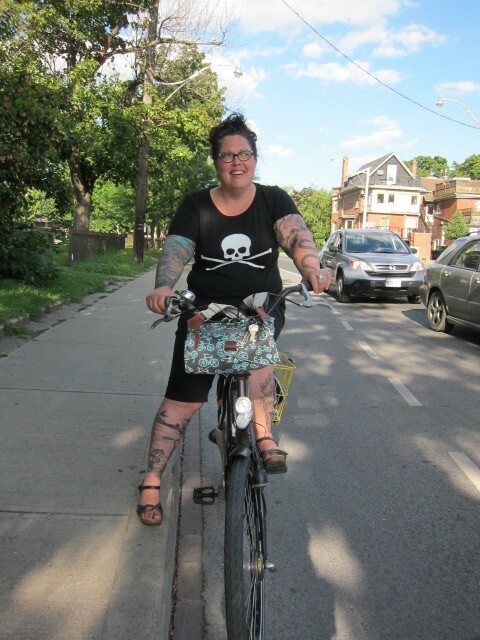 This June, the City announced it’s plan to replace the bike lanes on Harbord between Queens Park Circle and Ossington with bi-directional, Montreal-style lanes. 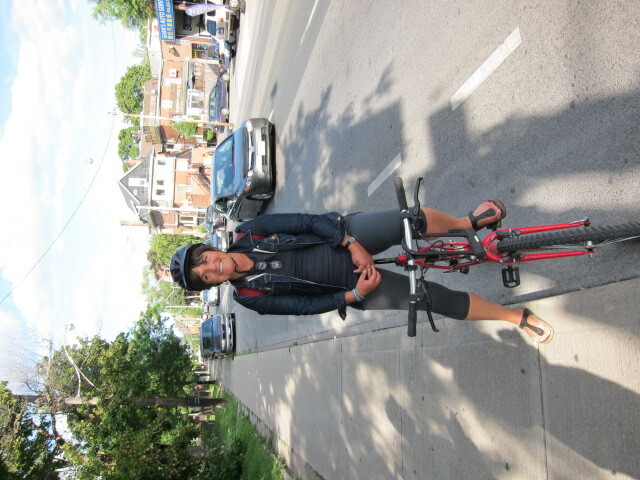 Now that the plans have been unveiled, we hit Harbord for a roundup of cyclists’ reactions to the proposed lanes. The proposed lanes will run on only the north side of Harbord. The lane on the south side of the street will be removed. 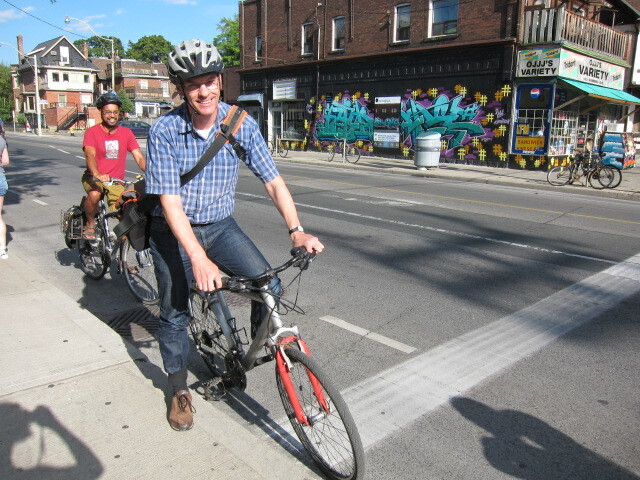 It has not been decided how the lanes will be separated yet, but the bi-directional lanes will allow for dual 1.5 metre-wide lanes in each direction, which is a bit narrower than those on Harbord now, which currently stretch two metres across. Public consultation on the proposed changes will be held until October. For more information and to sumbit feedback, go to the City of Toronto’s page. 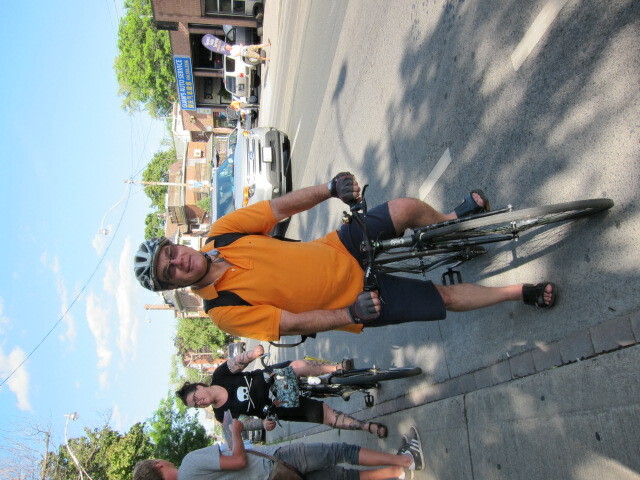 We went back to Harbord to talk to cyclists at the corner of Harbord and Major, asking whether they knew of the proposed changes, and whether they thought a bi-directional lane was the best solution for the street. Just having heard of it, I wouldn’t know how to assess it, but I think any proposal to make cyclists a part of the city substructure is a good proposal because we are citizens also, and I was in Holland for a while, and their bicyclists have the first right of way, and cars don’t hit them with their doors because it’s part of their understanding that bicycles are a component of the road way. So my feeling, anything that isolates bicyclists from other road users and increases safety would be a good proposal. How effective it will be, I have not assessed it, but I would say yes because what’s happened in the city, we’re not conscious of other entities except cars, the suburbs. So I would say people care about bicycles, this is the best proposal we have going. I would say yes at the moment. I can’t see any problems with the way the bi-directional lane is structured. I think it would make bicyclists a part of the city. It’s like the streetcars have their own space, cars have their own space, bicyclists should have their own space. There is space for everyone. I think it’s a really wonderful idea, probably the best east-west route for cyclists in the city, and separated bike lanes would make it safer for everyone. Once construction is done, I think it would be pretty seamless. I take these lanes every day, and it’s definitely the safest and fastest because there’s less car traffic. But it could still be safer for sure. I don’t like it. I do not like separated lanes, and I do not like lanes in which you cannot pass. Because the bi-directional lanes are going to be narrower, and they’re going to disallow passing. I like the freedom to veer into the road and to pass people who are going slower -it’s perfectly okay to go slower. We’re going to be crammed. This is a busy street in the number of cyclists, cars are cars, and we need room for that. I prefer to have it the way it is. Raised bike lanes are different. I live over there and I work over there, so I’m going to take Harbord even if there are separated bi-directional lanes. I am so used to the current lane set up on Harbord, and I am happy with it. 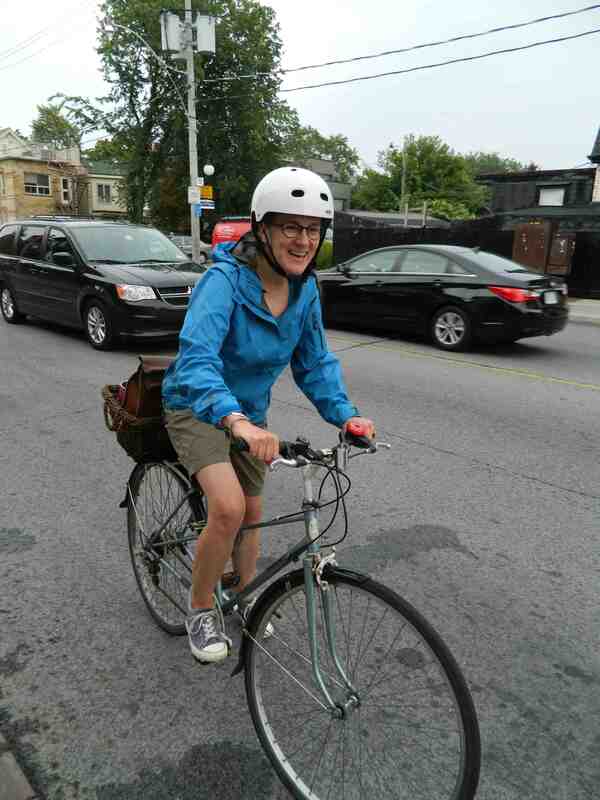 I don’t feel unsafe biking on Harbord or elsewhere on my commute. It is difficult to say whether a bi-directional lane would be an improvement. I certainly wouldn’t be opposed to it, but it is hard to say either way without trying it out first. 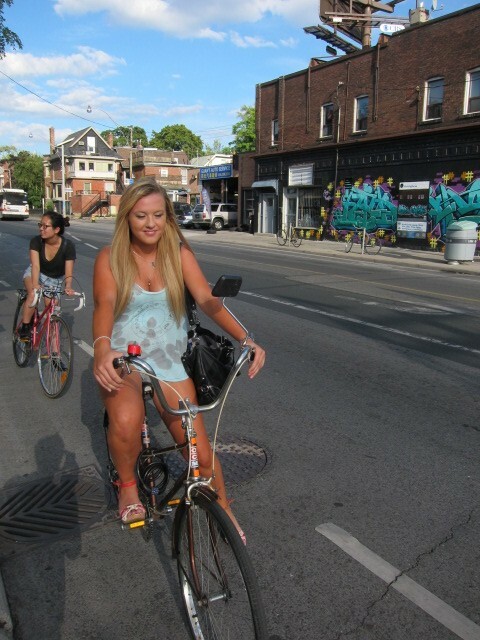 On a sunny summer evening, the Harbord bike lane has a steady traffic flow. 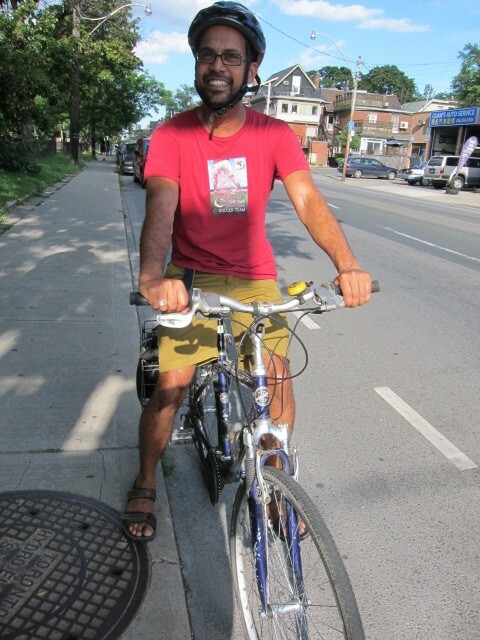 We talked to cyclists stopped at the lights at Harbord and Manning, and asked: Were you aware of the plans to install a bi-directional bike lane on Harbord? and Do you think this will improve the street? I don’t think it’s a good idea to have only one street in the city done that way. If they want to do it I think they need to do it throughout the entire city and not just one street. The separated from traffic part is good. I’ve seen the ones in Montreal but I haven’t used them. I guess I’m not 100% convinced that having both side by side like that is safe. As a pedestrian, I was crossing one and I didn’t look both ways because I’m used to traffic coming from only one direction. So that was a little confusing. As a cyclist I’m sure it’s fine because you’re on the path and you can see what’s going on. It also has to be real separation, not like Sherbourne where the cars can still roll up. I’ve heard about the proposed lanes. I have the same concern about this as I had when I heard about Sherbourne’s raised lanes, and that’s being able to pass safely. One and a half metres is not enough room to pass. And if the new lanes are separated by raised cement that’s squared and not round, then passing is pretty much impossible. Yeah, it’s fantastic! I really like it. I’ve never really considered a bi-directional lane on one side of the street. I like it the way that it is, it’s really accessible. I’m not sure it needs the change. But I’m also not sure what the studies have indicated, so I will read into it more. 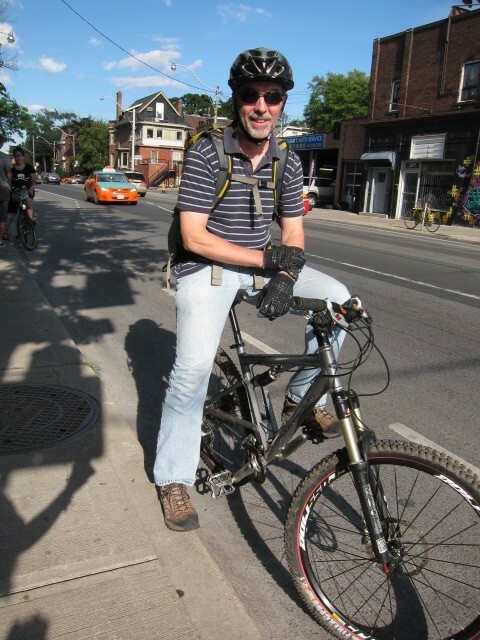 I cycle on Harbord every day and am happy with the current lane set up – It’s really great early in the morning when it’s not too busy. I think a new bike lane system may be a good idea as long as it’s not like the nightmare on Sherbourne, which has a major problem with parked cars blocking the lane. The proposed bi-directional lane could be an improvement here, although there needs to be enough room for passing slower cyclists since Harbord gets a lot of bike traffic, especially during rush hour. That sounds like a bad idea. I’ve had experiences riding in Holland for many years and it doesn’t seem like the City learns from what’s going on in other cities that are bicycle friendly. It seems like they make up solutions that are not designed very well. 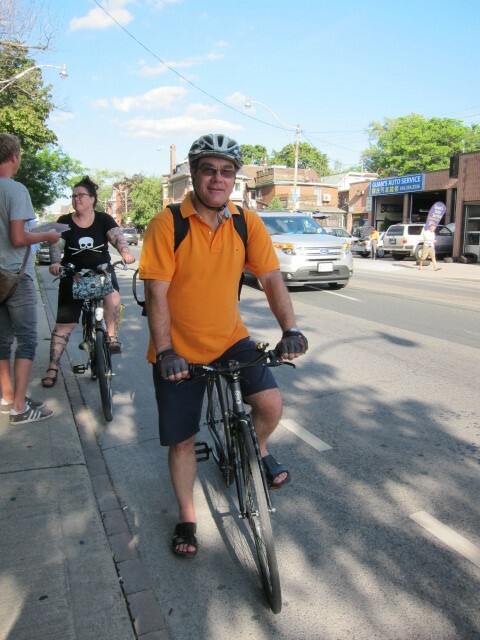 Sherbourne, for example, has a poor design, and Roncesvalles as well, speaking as a designer and a cyclist. So no, I don’t think that it’s a good idea, but that’s typical, for them to come up with a solution and not carry it out very well. I think it’s stupid. If the police want bikes to behave like traffic, we should be treated like traffic. Cars don’t have separated bi directional car lanes, so why should bikes? If the Harbord bike lane is going to be anything like Sherbourne’s divided bike lane, which is only divided in name, cars can still park in the bike lane. So cyclists will have to dismount and walk their bikes around the barrier to go around the parked truck or cop car. And with a bi-directional lane, you only need one truck to screw up both lanes. 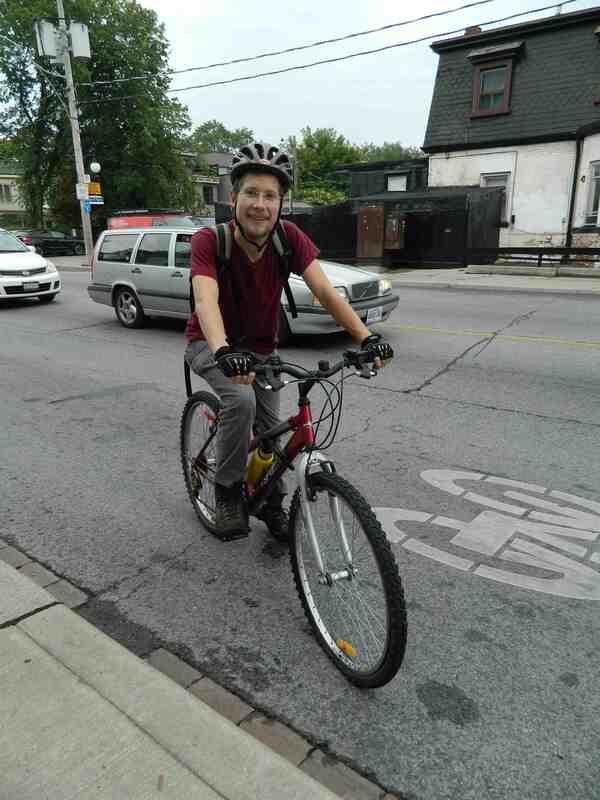 So I think that Harbord is an excellent bike lane, and it’s not broken so they shouldn’t try to fix it. One thing they should do is paint it like they did on Sherbourne to make it more visible as a bike lane. I didn’t know they were planning on putting a bi-directional bike lane in, but I think that it would be pretty cool. 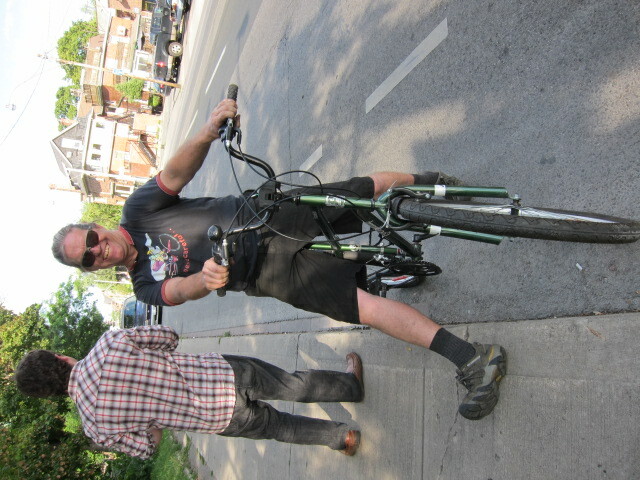 I’m not a big cyclist, but I use the lanes on Harbord. This selection of Bike Spotting was done as anecdotal evidence to support a larger feature in our Safety issue. 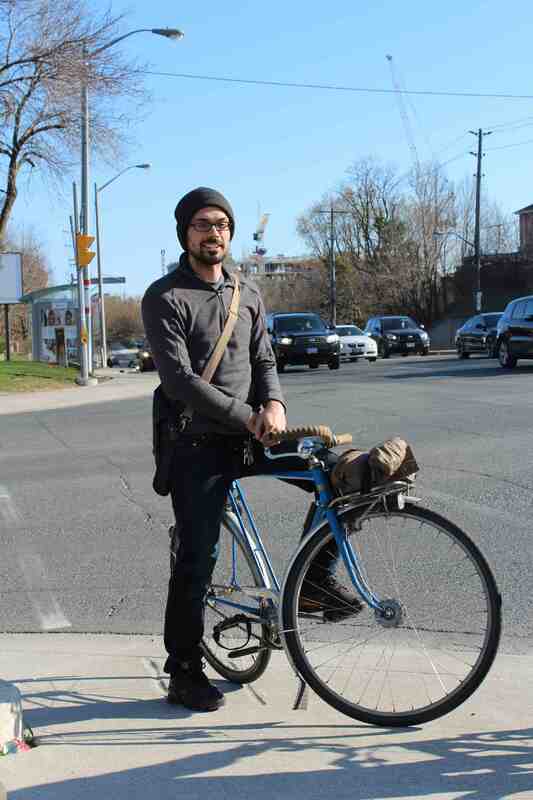 These Bike Spotting profiles are outtakes from the ones that were printed beside research by U of T that maps out Toronto’s wards in terms of bikeability. 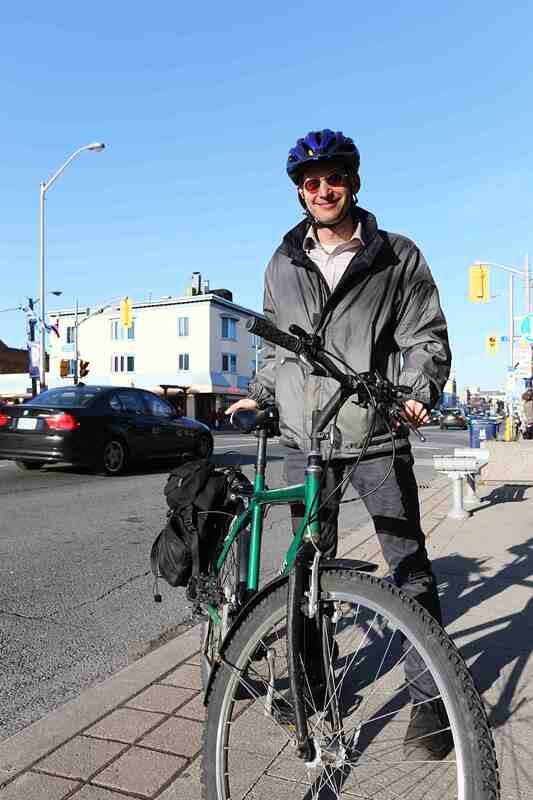 We talked to cyclists at Bayview and Blythwood, Dupont Triangle, Queen and Cameron, York University, the Danforth and Chester, Regent Park and Queen and Dufferin, to hear some of the safety concerns cyclists throughout the city have. 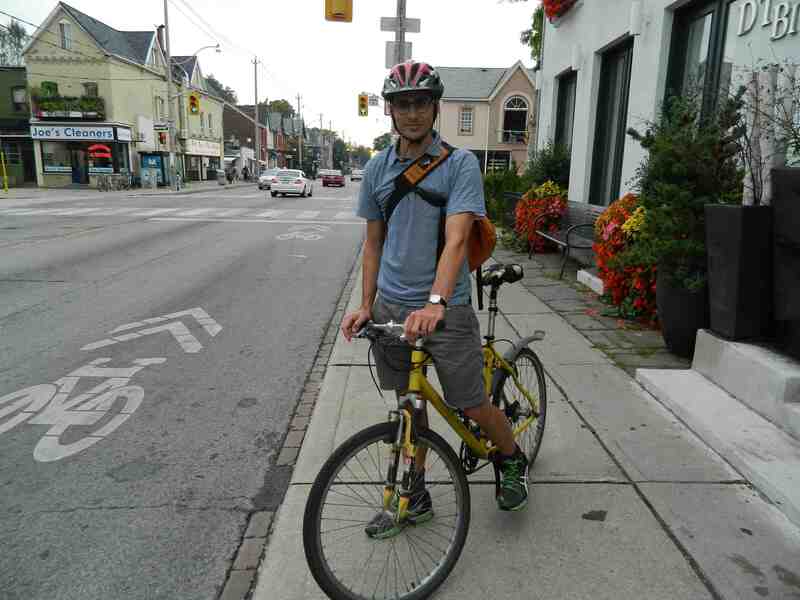 We asked: Do you feel safe biking here? What would you to to make it safer? 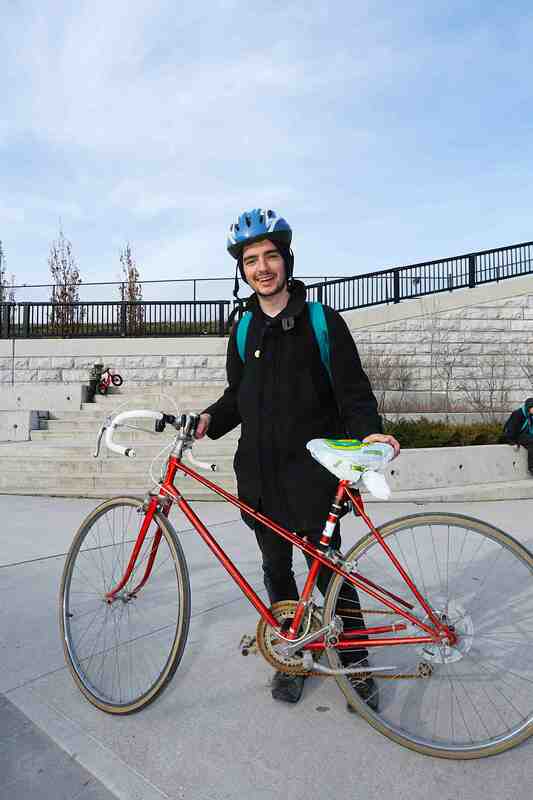 Also see our roundup of the Best of Bike Spotting with Safety in Focus. I don’t feel very safe here. There are simply too many cars; it’s already a busy street because the number of people who use the streetcars, and to have drivers zipping along trying to get ahead of the streetcars. It’s also really densely packed, weekends and weekdays. To make it safer they could reduce the number of cars and make it more difficult for single occupancy vehicles to travel on Queen Street, to make more room for bicycles. Compared with the University and Yonge area I feel safe here. But I’m a very defensive cyclist. University and Queen is awful. 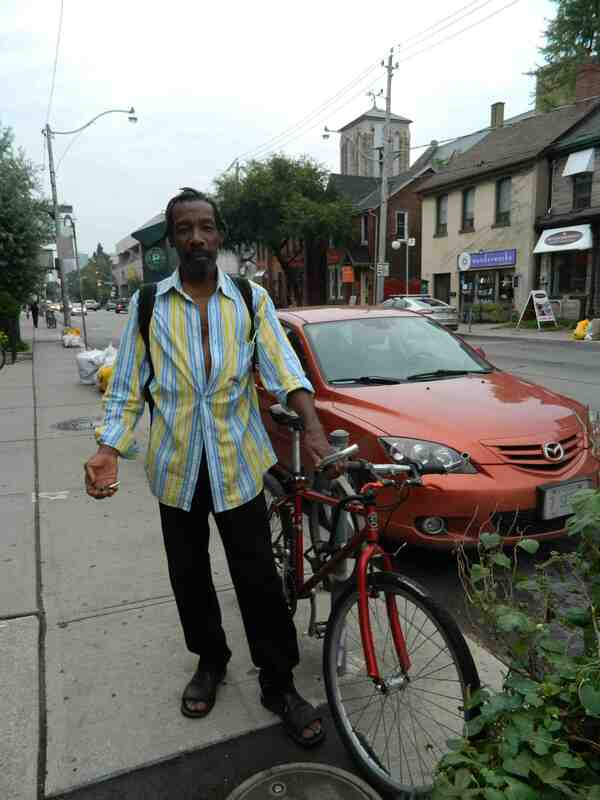 Usually I bike along King, and King is a bit rough. Bike lanes improve safety. But I think education for motorists (and cyclists!) about how bike lanes work is more important. It appears to me that cycling safety and cycling etiquette information has to be sought out. There has been no effective initiative from the government nor cycling communities to provide this information to those who ride regularly, but do not identify as cycling enthusiasts. I think reaching this large demographic is key to the safety of everyone. Lines in the road can only do so much, people need to understand what those lines mean and what needs to happen within those confines for them to be truly effective. There’s a bit of gravel, they’re constructing some condos or something. They’re dumping gravel where the bus stop is at the institute for the blind [CNIB]. But other than that, I’ve been pretty lucky so far, no major complaints. Most of the time it’s pretty fine. How safe I feel depends where I am. I definitely don’t feel safe on King Street or Dufferin. I think Queen Street could be more bike-friendly, but overall as long as I have my wits about me, I feel okay. 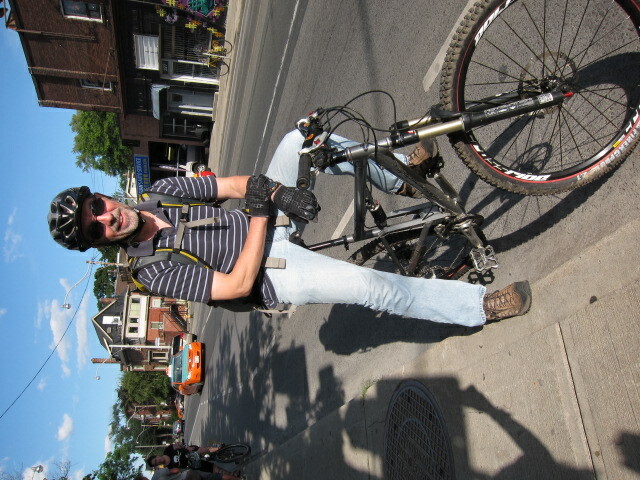 On Queen there’s so much bike traffic that folks are generally used to it. But you still do have to be really attentive about car doors. Adding bike lanes is a good start to make roads safer. I think bike lanes would be a really great thing. Around here, Dufferin is a street where there’s no parking and vehicles travel at quite a high speed. There’s quite a bit of aggressive driving on Dufferin. I don’t like to generalize but I do have that experience consistently and I wonder if it’s almost viewed as car territory or something, by a lot of folks. Vehicles are going at a high speed and there’s not a lot of room on the side, which is the makings of not only a scary situation but a really, potentially dangerous one. Well, I would say no in winter, when it’s dark, and at rush hour when cars are travelling 60 km/hr because I noticed there aren’t any speed limits posted on this street. 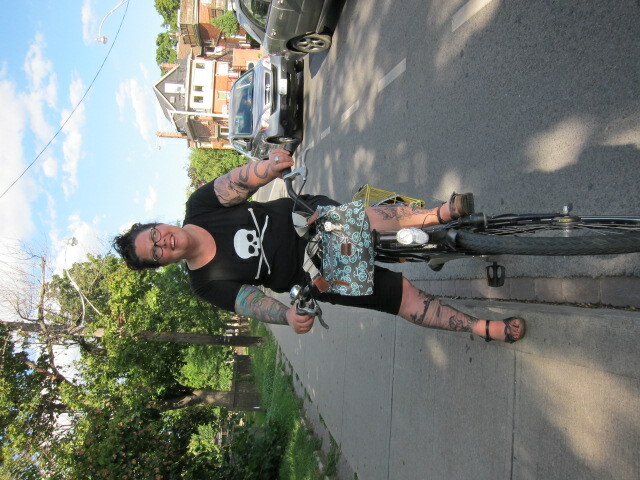 But, I feel safe once I get across Broadview onto a beautiful bike lane. Obviously it would be safer if the city gave us a little bit of dedicated space. It’s a very wide street, so I think it’s possible here. Yeah, sure. I’m a pretty athletic guy so I’m not too afraid of potential hazards or dangerous people. I’d only commute by bike during the day though. Obviously there are not enough by-standers or people to spectate potential hazards. Honestly, to make it safe you need designated bike lanes, but that’s impossible because the structures prevent it. Other than that it’s okay, but it’s not made for cyclists. 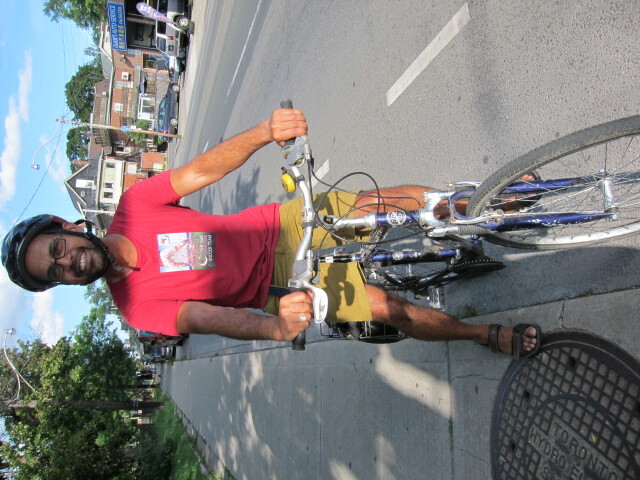 I don’t like biking on Eglinton, but Bayview is okay. There are a lot of trucks on Eglinton, and at the DVP ramps they get too close. Obviously lanes would make everything a lot better here. Special thanks to Vic Gedris, Heather Reid and Yvonne Bambrick. If you’d like to see more of their beautiful photos, buy the Safety Issue of dandyhorse. More Bike Spotting coming to the dandyBLOG soon! More in the Safety issue, pre-purchase it here!